Most of us are aware that germs exist in hospitals. We expect that stringent cleaning standards are being followed in order to kill germs that are lingering in the environment. How are germs transmitted in hospitals? It’s an important question to answer, as it endangers the lives of patients and staff. The Hospital Microbiome Project, a year-long study was designed to, “better understand the development of bacterial communities.”[i] This study gathered samples from surfaces, air, staff and patients. It is important to note that the study was conducted in a new hospital setting prior to opening and continued while populated with patients and staff. Findings showed the spread of germs were more likely to occur staff-to-patient than patient-to-staff. It also found that drug-resistant germs lived more numerously on surfaces than on patients. Additionally, germs already living on a patient spread to the hospital room. [ii] So after a hospital room is cleaned, when a new patient comes in, the bacteria on the new patient spread to the room. Staff to Patient or Patient to Staff? Another transmission study, conducted by Duke University, found germs were spread from a patient or the room to the scrubs a nurse was wearing. Another finding was that germs spread from patient-to-nurse and room-to-nurse. [iii] The significance of this study is that it introduces the room as a potentially equal source of how germs spread to humans. The nurse can contract germs from one room and then spread the germs to another. Unlike previous studies that found that germs were transmitted from staff-to-patients, this study found that nurses did not infect patients. Dr. Deverick Anderson states, “This study is a good wake-up call that healthcare personnel need to concentrate on the idea that the healthcare environment can be contaminated. Any type of patient care, or even just entry into a room where care is provided, truly should be considered a chance for interacting with organisms that can cause disease. [iv]” He goes on to explain the significance is that regardless of the task being performed hand washing and gloves or other protocols still need to be followed. In other words, it does not matter if the nurse is not actually physically touching the patient germs are still being transmitted to her. These studies seem to contradict one another. So, which one do we believe? We should believe both. It is always a good idea to view studies and articles as extensions of one another, or as extensions of the conversations around important topics we need to know about. Yes, scientific evidence is important but recommendations from the studies are in many ways just as important. If we have a mindset open to recommendations then we can glean greater understanding of how to implement solutions that solve the problems at hand. What matters here is that a new element of how germs spread in hospitals (via the room) has been identified. Hospitals and staff need to do everything possible to deal with germs in a room before they spread. Wiping down surfaces on a regular basis can reduce the surface-contact transmission of germs. We know that hand washing is a protocol diligently followed in hospital settings and as the aforementioned research shows regardless of the interaction, proper hand washing/sanitizing must always take place. It’s also clear that germs live on clothing and scrubs need to be washed daily either by staff themselves or the hospital- if such a service is provided. But, what if a nurse or other staff member brings clean scrubs to work, and puts them in a locker where germs exist? Keeping clothing clean is just one piece of the puzzle. This dilemma of a germ-inhabited locker adds a new twist to the situation. What if hospitals provided pre-saturated wipes in locker rooms so that staff could keep the lockers clean and germ free? Antibacterial wipes are a simple solution to this dilemma. 2XL is a leading manufacturer of cost-effective cleaning, sanitizing and disinfecting products for healthcare, fitness, food service, education, manufacturing, and other workplace environments. Our passion is to provide smart solutions for any environment where “clean” is important. We also design products that customers love using! 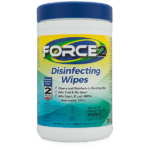 2XL Antibacterial Force Wipes are fast drying and effective against 49 pathogens. 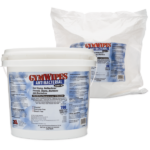 These wipes are powerful enough to meet the most stringent infection control standards. They are even effective against MRSA, Staphylcoccus aureus, Norovirus, HIV, Hepatitis, Influenza A. Show others that your hospital takes “clean” seriously. Provide the solution to keep your patients, staff and hospital healthy!